HomeNewsPhotokina 2016: Yep! I will cover the event for the 1st time! Photokina 2016: Yep! I will cover the event for the 1st time! Just confirmed! I will be at Photokina this year, and for the 1st time ever. Always have wanted to go to this event but never could quite get the scheduling right but this year, I am going and will be there for the event to cover all of the new releases from all manufacturers that I feel are putting out something worthy of talking about. I will try to do some live feeds on my FACEBOOK PAGE HERE, so if you are up for those, be sure to go to my FB page and give it a like! I will be uploading videos to my YouTube during Photokina week with coverage, so be sure to sub to my YouTube if you want to see those! I feel this will be a pretty good Photokina and I also feel we will have at LEAST three bug releases that I am interested in, MAYBE four, and maybe even more. I think something big is coming from Sony, Leica and Olympus with possibility of something unexpected from Fuji. Nikon and Canon ay have the same old same old, but who knows. I will also be checking out all kinds of things 😉 SO who knows but I will be like a kid in a candy store, a kid on Christmas morning! So while it is around two moths away, I am excited about attending this time around. Hope to see some familiar faces while there in Cologne! Back to Leica with the M-D 262 and 28 Summilux? Also heading down to the show as I will be close by, would love to meet up. Any plans on touring the Leica factory? I would love to go perhaps if there is a group of people that would be willing to go together? As always your site is a daily mental break with my Coffee in hand, keep up the great work. Thanks! I have not yet set anything up but would love to, 100%. I have never been to Photokina or Cologne, so if someone on that end could organize something we could all meet up. Leica factory tour would be amazing, but how far is it from where Photokina is? You asked how far it is from Cologne to the Leica Factory in Wetzlar, it is about 1 1/2 Hour drive by car. I live close to Cologne, 35 km Southwest. Yes you’re right but their are some Speed controls on the way to Wetzlar! Photo enforcement is very serious and very expensive. This is no joke. I know, but in Germany there are at least some highways that offer people freedom in contradiction to all other European countires. That also means that when there is a speed limit in place in Germany you should respect it for two reasons. 1) It’s probably there for a good reason. 2) If most people don’t respect it then the parts where you have the freedom will become restricted as well. EU is already trying Germany to impose a totoal speed limit, luckily the Germans don’t let the EU tell them what to do. And Germany has the lowest deadly accident rate despite of the unlimited speed highways. Reason: The Germans know how to drive and do so like a gentleman. Well, many of them anyway. Where I live a lot of people drive like idiots on the highway and seem to think they can enforce the law if they see a car coming fast on the left lane by suddenly blocking him. Now that’s dangerous as well … sorry, not gonna use the word. Generalizations like this one (mine) are generally useless. It’s about 160 km, that’s 1000 miles. A visit to the Leica plant would take an extra day, I guess. Veru interesting, no doubt, but I would pass, since I can only spare 1 day and the Photokina show has priority. I’ve been in Wetzlar at Leica last week! If you come to the Photokina then you Must see the Leica Factory Four sure! It is really impressive to see how these goods are made! Keep me posted as well please folks, eally intersted and would do everything I can to make myself free. Can’t help you with Koln though, never been there and I’m not from Germany. Great city for photography though. Hey Steve. Is it a good idea to organise a meeting place and time at Photokina with European followers of your site, that don’t have the opportunity to cross the oceaan that easily to participate at one of your events in the States? I just may! I have a few wanting to meet up and it would be cool to do just that! You may drop me a mail as well. I might be able to go but I can’t assure that this long in advance. But at least if I know there’s a meet I can try to schedule it in. It’s a 4 hours drive for me. Well, actually 2 ½ hours, 4 hours for normal people. Please look for new monitors and printers too. Love to know what you use in evaluating of lens. Steve, It’s great that you can be at Photokina!! This will allow you to gather even better intel on the new Leica M (and hopefully an M-D 262 like model will be available earlier in the cycle instead of at the end) and the update to the E-M1. Enjoy!! Excited to see your reports! One question Steve: if you look really deep into that crystal ball, what do you see from Fuji? Does it concern glass? By the way, I’m delighted with my mahogany bison Maven straps I discovered through your site. They aren’t easy to find on the HF website unless you look into the shop part of the HF site. As I live in Europe I was only looking at his catalog and checking the two importers here who don’t carry the Maven. I ordered them straight from HF and got them in 3 days. Not only an amazing look and feel but also so very practical with the bronze clip to remove them when you want to switch to the MoneyMaker or just a wrist strap (HF Leash). Thank you! I agree, that strap is very nice. 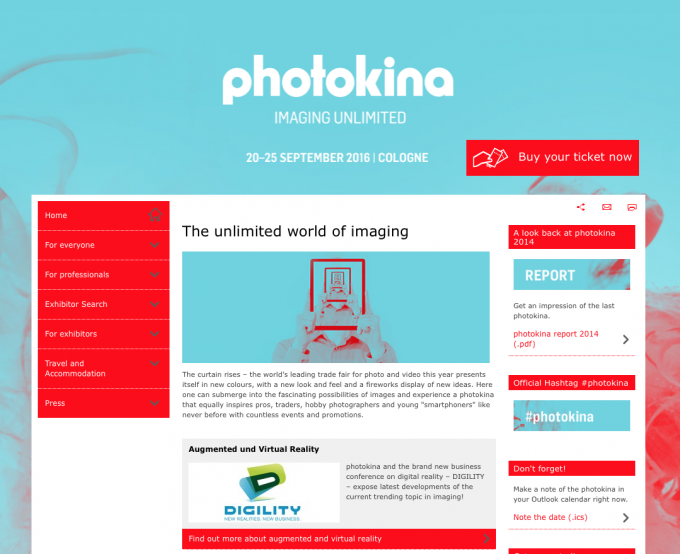 Beware of the photokina bug…. you might get used to it. Enjoy your trip!